This outdoor table model is one of only a few in the world that are made to be used for the backyard or tailgate. Equipped with a cover to protect it from the elements, it is also constructed to be protected from exposure to sun and other moisture. 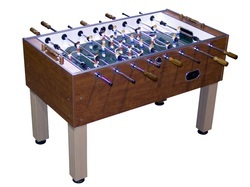 It offers a single goalie design and a more traditional foosball man design. It also has legs that have wheels on the bottom for easier transportation, so it can easily be maneuvered around on your patio or deck. 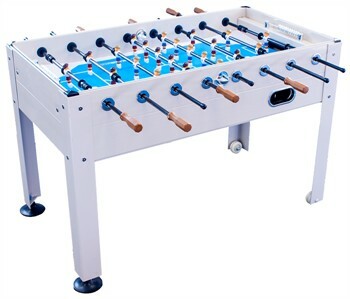 The most unique feature about this model is that it comes in both a standard 4 player size as well as a 6 player. The 6 player is extra long and features two additional rods on each side of the table. This table is priced at around $575 US.